So much zucchini, but what to do with it? Fried zucchini? Delightful, but fried. Grilled zuke? Awesome, but I am grilled out. Zucchini fritters? My mom makes the best so why even try to top perfection. Here’s a super easy, equally impressive zucchini recipe. Heat oven to 400. Line a cookie sheet with parchment paper. Mix the cheese bread crumbs and spices in a mixing bowl. 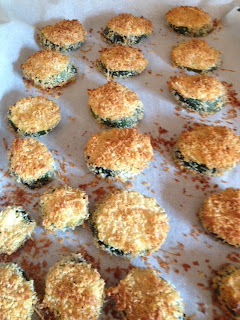 Line your cookie sheet with zucchini and bake for 40 minutes. You can also serve with a side of red sauce for dunking or make a fresh tomato topping to serve like bruschetta.